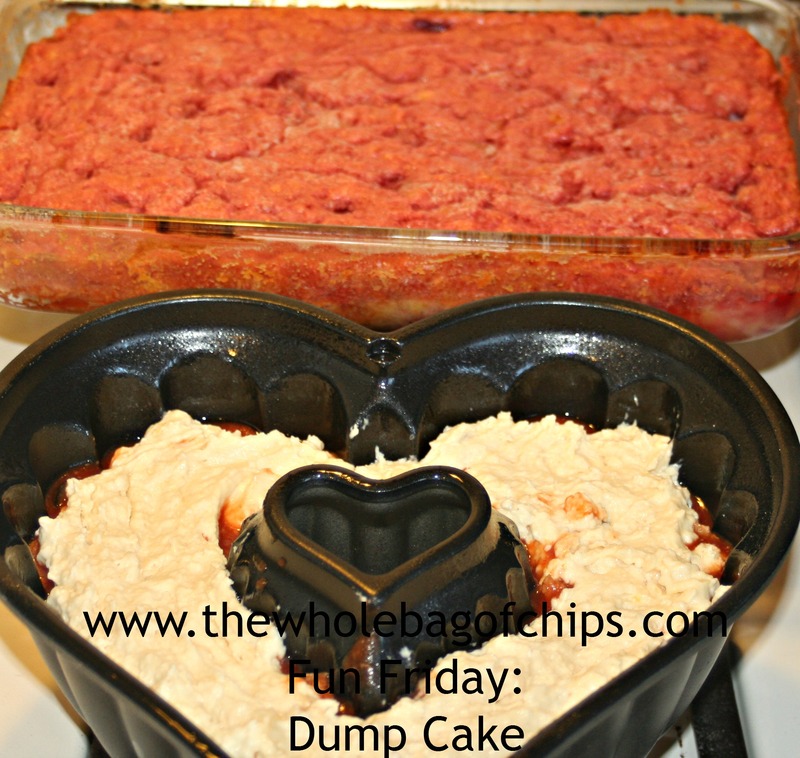 Fun Friday: Dump Cake for April Fools Day or any day! This was a quick and easy dessert! In a recent What’s for Dinner Wednesday post, I mentioned that the stir fry recipe I was trying out reminded me of a cake recipe I’d once heard of called Dump Cake, because like that cake recipe, the stir fry recipe was one where you just dumped a whole bunch of ingredients in and cooked them. That reference in my post got me thinking about Dump Cake recipes. I couldn’t remember having had one myself and I wasn’t even sure where I’d heard about Dump Cake, but I knew I had somehow, from somewhere. So of course I turned to Google and searched the term Dump Cake to see what kinds of recipes would come up and to see if Dump Cake was something I’d like to try making. As I looked, I found that they varied slightly in the types of ingredients that could go in them. Some had canned fruits, some had fresh. Some had butter: one stick or two, and some had a can of soda. They all used a yellow cake mix and all called for an optional addition of chopped walnuts. I decided to find one somewhere in the middle. I had a can of crushed pineapple already and a yellow cake mix. I did not want to go the soda route, so I knew I’d be using butter (we use I Can’t Believe It’s Not Butter), but I didn’t want to use a lot. Ultimately, I chose a recipe that used a can of crushed pineapple, a can of cherry pie filling, one stick of butter and a cake mix. I did not choose to use the walnuts. The recipe I chose was from Allrecipes.com, and it claimed to be “as easy as dumping ingredients in a pan,” and it sure was. There were enough steps for everyone to have a turn helping to make the cake. We were using this as part of this year’s April Fools Day dinner, our first ever, and the girls and I were in cahoots, creating a fun meal for their dad. Part of the fun was having a “cake” for dinner and this Dump Cake for dessert. The “cake” for dinner was going to be heart-shaped and as it turned out, our Dump Cake turned pink, so it was a very funny meal to be eating in April. The recipe, as it appears on Allrecipes.com is below. It truly is as easy as they say, and it was really tasty too! We had ours with a simple squirt of whipped cream, but I’m sure it’d be delicious with ice cream on top too. I’m also sure that any variety of fresh fruits would be good as well. The only thing I was unsure of was whether or not to spray my pan with non-stick spray, and I opted to do so, rather than risk the cake not coming out of the dish. 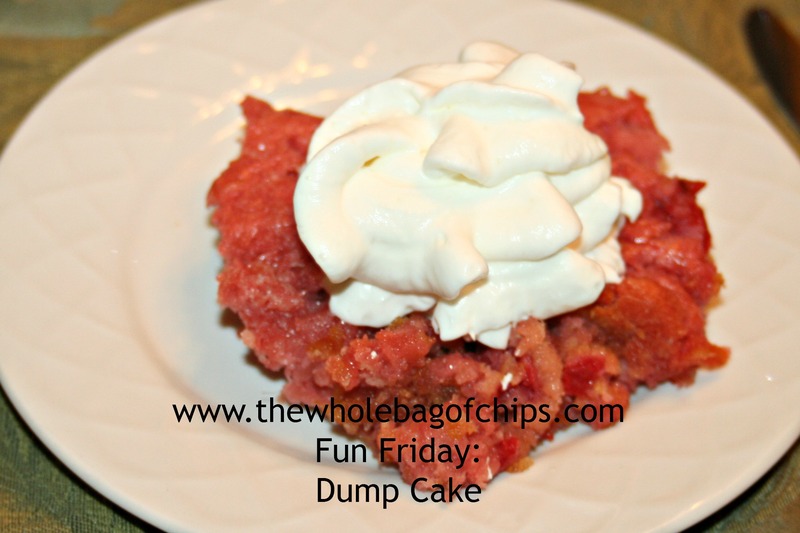 Next time you’re looking for a fun cake to make, remember my April Fools Dinner and try a Dump Cake! A few ingredients were all we needed! In a 9×13 inch pan mix cherries and pineapple. 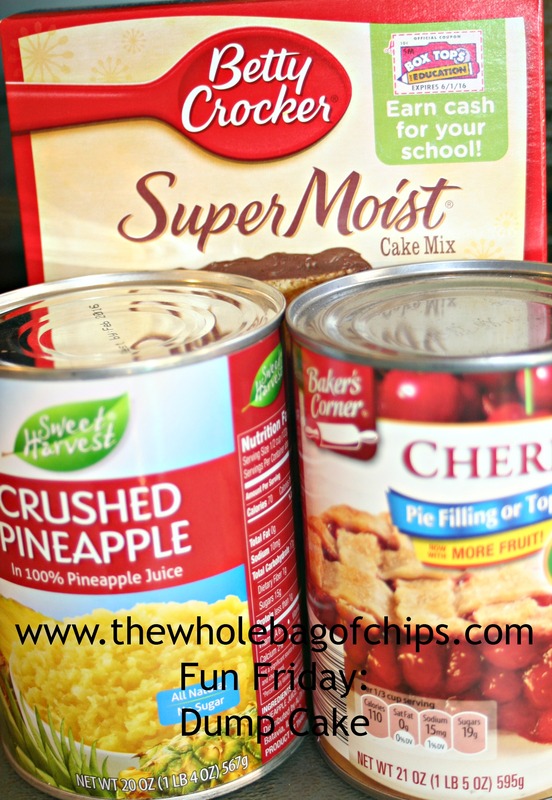 Sprinkle dry cake mix over pineapple, and cherry mixture stir until just combined. Then sprinkle walnuts over top. Drizzle top with melted butter or margarine. Bake in a 350 degree F (175 degree C) oven for 35 or 40 minutes or until golden brown. “Cake” for dinner and Dump Cake for dessert for April Fools Day! ← What’s for Dinner Wednesday: An April Fools Day Dinner!